Who do you know who gleefully spends decades flying around kitchens cooking, serving, creating and generally glowing while tirelessly persevering to bring love-filled food to local NC residents? If you haven’t yet met Terri, The Food Fairy or any of her 20 some offspring, (aka foodfairyettes), you still have time because she isn’t done yet! In October The Food Fairy will begin her 20th year in business serving up personal chef daily-fare, party-time or cooking class services “once a week, once a month or every once in a while”! Try some fairy food and you will intimately know cloud 9! Since 1996 Mama Fairy, Terri, has trained over 20 women, mostly moms, to work their fairy magic in Triangle kitchens! Some fledged after studying with Terri for several years and began their own businesses, some entered other areas of expertise, two, Krystal Rosso-Feren and Becket McGough have left and actively returned to the fairy-fold and some had babies! 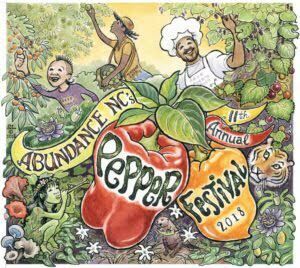 This fall two new chefs have been added to The Food Fairy staff, their pictures and bio’s coming soon, with a total of 7 nurturing fairies flying around North Carolina! This year one Food Fairy, Whitney Dane, had twin boys in March! Another baby was born in March to another Durham based food fairy, Molly, and Krista Binford had a sweet baby girl, Rylee, in September and she is back in the kitchen! Jan, who has been with The Food Fairy for four years also had a girl, Rose, in September. Is this nurturing fairy-magic contagious? Terri’s oldest daughter had twins in April 2014 and her middle daughter had a son, Jack, on September 21st. Terri is a grandma-fairy now! All fairies have been women but Terri says she’d love to have a “Dude-Fairy” on staff when the perfect guy chef arrives here on Cloud 9. Speaking of far-a-way places, there is now a Food Fairy in NY State. Terri lived in Sullivan County, The Borscht Belt, for 23 years before moving to NC. Her contacts there lead her to Kristen Rieber who is representing The Food Fairy in Sullivan, Orange, Ulster & Rockland Counties! Kristen, a mother of two, is a high energy, creative lady who is much like Terri 30 years ago, working hard to nurture, feed and support her children and send them to the best of private Montessori schools, The Homestead School of Glen Spey, NY. Terri believes that finding folks who love what they do and putting them all together really makes a spectacularly strong and happy business for staff and clients! Speaking of New York, Terri and her staff of 7 just served up a wedding for Tony award winning actress Victoria Clark and her debonair husband, Tom Reidy. It was hosted in Durham by the bride’s brother Jeff and his wife, Charlotte Clark, who wrote, “Saturday was so amazing in every respect. Your preparation was (to my eye :>) impeccable, everything was so beautiful and so good. Of course, I love knowing how carefully all the ingredients were chosen too! Jeff says that he thinks that was the best Food Fairy meal he has ever had and that is very high praise indeed!” The full love story was written up in The NY Times VOWS section Sunday August 16th, 2015. Since the release of her 2009 innovative cook-a-long DVD, Cook-Once-Eat-For Weeks, Terri has been encouraging families to eat together and to eat well even without a personal chef! In 2015 Terri has been a consultant to Advanced Wellness Systems* as they produce their nutrition and food module. “I truly thrive when I nourish myself with new avenues for sharing my experiences and expertise.” Terri said. When asked by her Uber driver what she enjoys cooking the most she unveiled her love of creating the most memorable and tongue titillating meals for folks on elimination diets. “I created this rice-scallop croquette from what the client had in her pantry and freezer and it was so delicious I proceeded to adapt it for others on similar restrictive diets but using chicken, tempeh or shrimp as the protein. I eventually perfected it for the Clark-Reidy wedding with chicken or tempeh for vegans, filled with a dairy-free Thai Peanut Pesto and topped with a roasted mango basil sauce. *Advanced Wellness Systems offers robust wellness programs that equip people to thrive and flourish, based on decades of scientific research and practical employee-wellness program experience. Unlike traditional programs that focus on avoiding illness through diet and exercise, AWS focuses on building vitality– the sense of being alive, passionate, and excited. AWS methods position people to increase their health and vitality, leading to high job performance, resilience, and creativity throughout the workplace. For more information, visit http://advanced-wellness-systems.com.